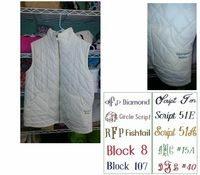 Vest: Please Choose OnePink XL-1 LeftGray XL 1-LeftCreamL-1Left"Gray S-2 LeftMint S-2 LeftCream S-2 Left Personalization: Please Choose OneNoneSingle InitialMonogramName Initial, Monogram, or Name: Font Type: Please Choose OneNoneDiamond (monogram)Circle Script (monogram)FishTail (monogram)Block8Block107Script10Script51EScript51A#15A Font#40 FontCurlyStacked(monogram) Block Stacked (monogram) Thread Color: Please Choose OneNoneRedOrangeYellowDark GreenLight GreenBlueLight BlueDark PurpleLight PurplePinkBlackBrown Embroidery Placement: Please Choose OnePocketLeft-Chest**Yoke** **Placing Embroidery on Left Chest or Yoke will be done on quilted side and the vest will not be able to be reversed. : NoOK Who is this item for? These quilted vests are the perfect accessory for every season! 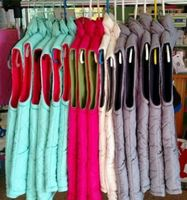 Quilted Nylon on one side and Fleece on the other. Monogram will be on pocket unless selected on Left Chest or Yoke which will be done on quilted side and vest will no longer be reversible.